As he had many times before, Huang helped a high-school student solve a computer programming problem that the student had posted to Reddit, where he is known as Kristler. In the Reddit thread entitled, Changing the color of a bug based on direction, a high-school student asked how to create a program to solve a particular problem. Huang responded with, “Since this is a class assignment, I’m not going to answer it for you, and neither should anyone else.” He went on to ask probing questions that helped the student discover the answer for himself. Huang has some experience as a teacher. In Grade 9 he organized and taught the First Aid class for his secondary school. In high-school he also took an elective in Peer Tutoring and worked in his school’s learning support centre helping students with learning disabilities. Taiwan-born Huang has lived in Vancouver since age five. He began studies in the Irving K. Barber School of Arts and Sciences at UBC’s Okanagan campus this September. Huang hasn’t settled on a major yet, but is interested in either computer science or mathematics. His professors are sure he will excel at whatever he chooses. 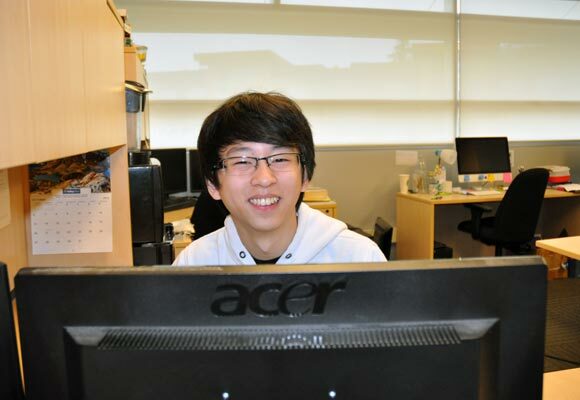 Huang may still be a teenager, but already looks ahead to eventually earning a PhD, and working in the field of mathematical cryptography.